Many of Saint-Jean-de-Luz’s buildings are unified by their crisp-white bases. From there, they’re adorned with shutters of all shapes, sizes, and hues, making them look like doll houses come to life. Some of the homes’ balconies are fashioned out of twisted iron whereas others feature wooden balconies sporting linear designs. Half-timbered flourishes, grey stonework and red-clay rooftops also add finishing touches. Are you headed to French or Spanish Basque Country, and need inspiration? Please peruse my posts featuring a walking tour of Bilbao, visits to the Guggenheim Museum, and Rioja Alavesa wine country. Also see the Basque Country Tourism website. I love these windows!! So colourful against the white. The color palette does mesh quite nicely with the blue Atlantic, Darlene. :) I bet you’re spying some notable architecture in Spain right now? Freebutfun, glad you enjoyed the round-up of windows from France! Thanks for the quick tour. I was not familiar with this locale but now I know a little bit about it and where to find out more. Greetings Robin, my knowledge about Basque Country was also pretty limited until we spent two weeks in the region. I was pleasantly surprised – Bilbao (where we based ourselves for 2 weeks) has wonderful museums and a great comeback story, and there are many picturesque spots along the coast (in both France and Spain) that I’d love to see more of someday. These are colorful and inviting; makes you want to peek inside…using a ladder, of course. 😌 Sounds like this was a lovely trip,Tricia. Lynne, no binoculars? :) It was a wonderful trip last summer – Basque culture is really quite fascinating! Love these doors. They’re so light, colorful, and beautiful. My husband and I are thinking of going to France this summer. This looks like a beautiful part to explore. Thanks for sharing. Hi Monica, exciting that you’re contemplating a jaunt to France in the coming months; have you pin-pointed a region to explore? Thank you also for stopping by – glad you enjoyed the peek at Saint-Jean-de-Luz’s unique architecture! We have thought about spending a little time in Paris and then heading south to Provence. We’re traveling with our little baby, so we’re hoping to find some place beautiful and sleepy, where we can take long walks and long lunches! Monica, sounds like you’re giving the travel bug to your little one early on – that’s great! I haven’t yet been to Provence but I imagine you’ll find some quaint villages that are perfect for the type of delightful, slow travel that you described. I’d love to get to Provence some year to see the lavender fields in bloom; perhaps your visit might coincidence with that? So colorful. I wish we had more interesting and colorful modern architecture. Jeff, I too love the whimsical details and splashes of color that we’ve encountered – largely on the road. I haven’t been to Alaska, but I’m guessing there are some buildings with interesting flourishes that are unique to the state though? Those windows are beautiful. I found from books, blogs, tv program etc that many parts of France are really beautiful, especially in country sides. It was too bad, I just visited Paris during my short visit to France last year. I wish, I can see the other part of country sides someday..
Nurul, it sounds as though Paris whet your appetite to explore more of France someday. I used to live in Germany for many years, and made frequent weekend trips to the French countryside – mostly in Alsace and Lorraine, where some of my ancestors came from. Provence and Burgundy are high on my list though! Here’s hoping you’ll get the opportunity to revisit France sometime soon. It is a beautiful and varied country. A marvelous collection Tricia! We are planning a visit to the Basque region later this year, but not to the French side. Madhu, glad the post could get you in the mood for your upcoming Basque adventures. What Spanish spots are you planning on exploring? As you may remember, we greatly enjoyed our time exploring Bilbao’s art scene, and getting a feel for the wine culture in Rioja Alavesa. The pintxos (tapas) are also a treat! Oh, I want one of those little balconies with the black wrought iron work. So gorgeous. European windows are always so colorful! That third window seems like it is missing its vivid shutters? You have an eye for detail, Bespoke Traveler! I’m wondering if the salty sea air nibbles away at the paint more rapidly, necessitating regular repair of those shutters? Ah, no doubt that is the answer to the missing shutters. Lovely window shoots, Tricia, I love windows and doors,, they stories who lives inside of the house. Cornelia, having grown up in a setting like Bavaria (where there’s so much Lüftlmalerei), I can see why you appreciate refined architectural details. Hope your week is off to a good start! Thank you Tricia, that’s an interesting analysis of yours, never thought about that. Have a great week as well where ever you are. Gorgeous pictures, I want to go now! Kristie, glad you enjoyed the compilation of windows from France’s Basque country. I see you’re also a fan of Paris’ passages? Yes I love the passages! So nostalgic and still very ‘old paris’. You spent some time in regions that make excellent wine and cheese. I hope you enjoyed plenty of both. Gerard, mais bien sûr – from tapas time (pintxos) to more elaborate lunches, we enjoyed a blend of both :) How has your honey wine (mead) production been going these past months? I made a 5 gallon batch of cyser, that’s an apple juice / honey / water mixture that is fermented. I made it in November and it’s ready now. It’s good! I’m very pleased with the way it came out. I will post a blog about home winemaking soon. I’d love to share some with you. Gerard, I’ve never tried a fermented blend like that, but you’ve certainly piqued my curiosity. Perhaps at some point we’ll meet at the same latitude and longitude, and Shawn and I will be able to taste your cyser masterpiece. :) Wishing you a splendid Saturday! Tricia, that would be fun. Love the window pictures – I take a lot of door photos now – my husband thinks I’m crazy – but one of my more popular photos in my etsy store is a photo of a door in Murano! Really liked the doors and windows of Bilbao. There are so many lovely old houses and buildings scattered throughout the city to be loved and adored. Hi Dale, it sounds like you and Franca also took a liking to the area. Shawn and I both concluded that we could see ourselves enjoying many sunny mornings in one of the miradors (enclosed glass sun porches) gracing the fronts of the buildings in the Old Town. 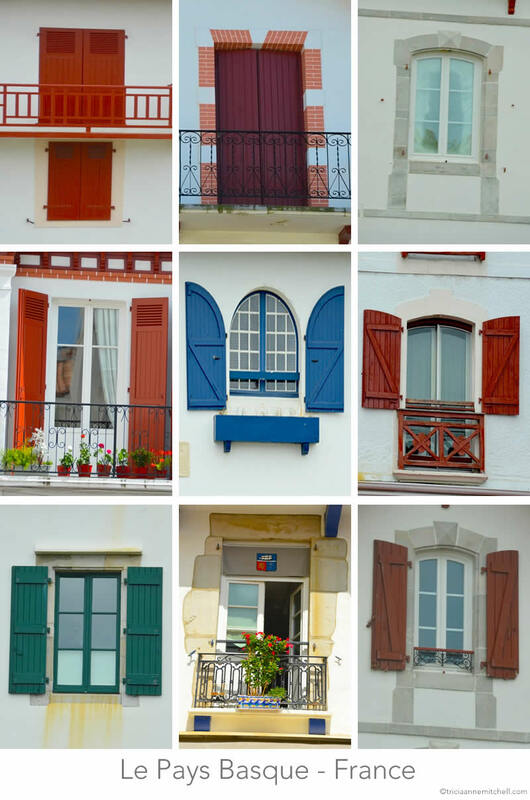 A seaside view from one of these windows in Saint-Jean-de-Luz would be splendid too! Jessica, you must be delighted to be moving to France next year – in what part of the country will you be living? Glad this post got you in the mood for your French life chapter! I love these photos– The windows are so quirky! Emma, the quirky windows of the world are precisely what inspired me to start this site’s Collage series. :) Glad you enjoyed this set from French Basque country, and thank you for the compliment. What a lovely idea to capture colourful and a variety of windows. I think all over Europe has all the ingredients for a great travel destination! I have one framed poster of ‘Thresholds of Prague’..we bought during our holiday there. These windows brought back those memories of admiring the doors in Prague. Hi Veena, and thanks for stopping by. We’ve been lucky to have tiptoed through a lot of countries, and the Collage series seemed the perfect way to round up all the beauties that we discovered along the way. Prague, of course, has an abundance of stunning Old World buildings. Your ‘Thresholds’ poster must feature a beautiful sampling of the city’s architecture. When were you last there?